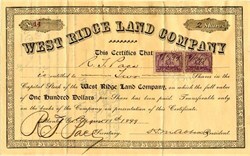 Beautiful certificate from the West Ridge Land Company issued in 1899. This historic document has an ornate border around it and has the signatures of the Company's President, H.M. Abbett and Secretary, R. S. Pace and is over 107 years old. The Abbett Inn is a landmark in Historic Downtown College Park. Built in the 1880's it was the home of H. M. Abbett, secetary and treasurer of the Atlanta and West Point Railroad later passed down to his granddaughter, Miss Frances Mason. The 4000+ Sq. Ft. Victorian House is situated on a triple wooded lot in a quiet neighborhood of Downtown College Park. College Park was developed as an academic community for Cox College, which closed in 1923, and the Southern Military Institute, which now is Woodward Academy, the largest private preparatory school in the continental USA.